I came across this interesting paper on the last lava flow to threaten Lower Puna, just 3-4 years ago. It brings home just how remarkable the current eruption is. Poland’s paper says that the Pu’u O’o lava flow (Episode 61e) that started June 27, 2014 was the longest at Kilauea in the past 500 years. * It eventually reached a length of ~20 km (12.43 miles), but it took until March 2015 to get there. Its average rate of speed was 0-500 meters a day. By contrast, Fissure 8’s current flow started on May 26, 2018, and covered 13 km (8 miles) to the ocean by the evening of June 3 (eight days). At times it exceeded 500 meters per hour. I wondered why some residents of the Kapoho area said their evacuation orders came with “no warning,” or they didn’t bother to evacuate their belongings, or they didn’t think the lava would reach their house, even though the eruption had started a month before, and lava had been moving their way for a week. But they’re used to the Pu’u O’o eruption of the past 35 years, which took years and years to reach and cover the community of Kalapana. The current eruption is covering as much ground in a week as Pu’u O’o took months to cover. And Pu’u O’o was traveling farther than any eruption in 500 years. No wonder people were caught flat-footed! 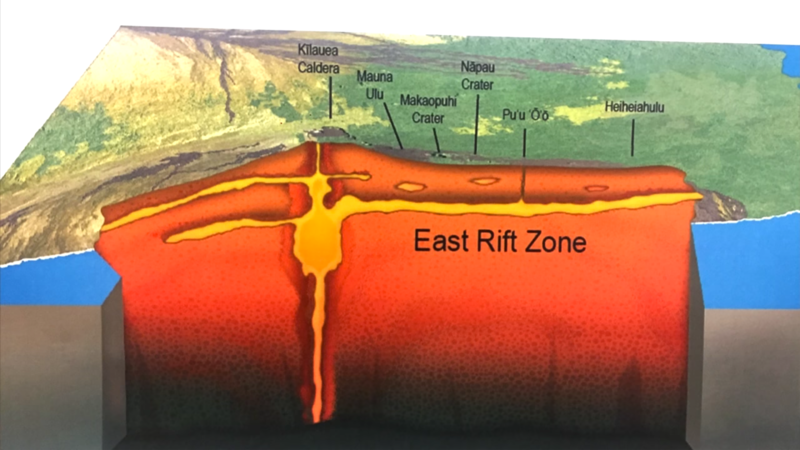 Below: I created an animation of 3 HVO/USGS maps to show Pu’u O’o vs current Lower East Rift Zone lava flows. USGS June 10 map of active lava flows in Puna (Lower East Rift Zone) since May 3, 2018, with current flows in pink and historical flows (including the 2014 Pu’u O’o mentioned in that paper) in purple. In short, the current 2018 eruption is hotter, faster, and covering so much ground that it’s surprising even to geologists, let alone residents. This is not the kind of volcanic eruption they’re used to. If you’ve followed this blog at all, you’ve come across the terms “pāhoehoe” and “a’a.” They’re Hawaiian words borrowed by volcanologists as technical terms for different types of lava. How can you tell which is which? When I visited in 1986, the joke was that “a’a” is the noise you make when you walk on it, because it’s prickly, and “pāhoehoe” is the smooth stuff. But that’s oversimplified, and it confused me. Some of the old pāhoehoe flows we hiked on near Mauna Ulu seemed pretty bumpy to me. Pāhoehoe moves forward by inflating lobes of lava with fresh new lava from within. It advances mostly by chunks tumbling forward off the front. Both kind of lava make crinkly noises, but I think of a’a as “clinkity clankity” lava, whereas pāhoehoe tends to slither. Tuesday evening, USGS Volcanologist Steve Brantley gave a presentation in Pahoa High School. A lot of it is fairly simple, recapping the eruption for residents of Puna. I’ve covered most of what he does in previous posts. But there are a few new tidbits. …until that balance is reached, or something else changes, we expect magma to continue moving from the summit reservoir into the rift zone and further down into the Lower East Rift Zone. So that suggests that we’re in it for the long haul. We don’t know how long this eruption’s going to last, but for now, it looks like it’s just going to continue. BigIslandVideoNews just put up an edited video of Saturday’s USGS press conference. My hero Don Swanson is there. It’s INCREDIBLY informative on what they think is happening at the summit and why they think it’s a repeat of the “much smaller eruptions” of 1924 and not larger ones. I wasn’t going to do this, because hazard information is best left to emergency officials and experts. But I don’t want the videos and images I’m sharing to mislead people into thinking this event is larger-scale than it is. It’s overwhelming to those who have lost homes or had to evacuate. I don’t want to downplay what they’re going through. At the same time, major hazards are confined to a very limited area, yet news media are whipping this up to apocalyptic proportions and tossing out headlines with “fears” and “anxieties” and “major” to scare people. I don’t want to add to their hype. A volcanic eruption one can watch from a few miles away without dying is moderate, not major. So let me try to give a rundown of Kilauea hazards, and why I think it’s not greedy nor crazy for officials to be urging tourists not to cancel their visits. So we’ve had some questions about what code red means. It sounds a little bit alarming, It’s really just to say that we see significant amounts of ash from this ongoing activity, and to warn aviators about that ash. It doesn’t mean that a really big eruption is imminent. it’s really just characterizing the aviation situation.